Pictured are the students of Point Pleasant Live at PPJ/SHS. Students record several events within their school such as sporting events, assemblies, graduation, class night, and school wide public service announcements. 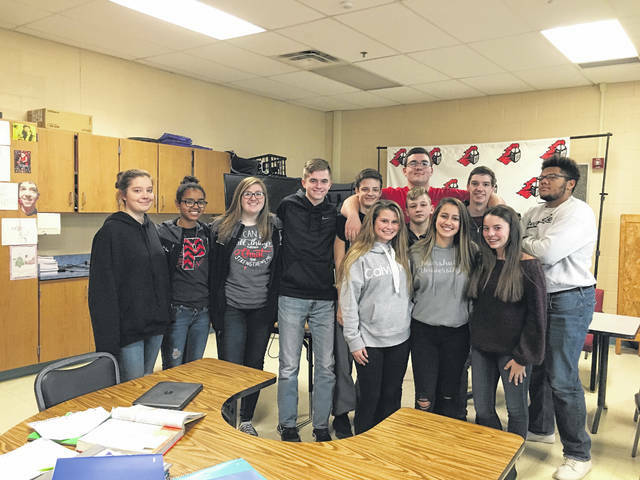 POINT PLEASANT —Each year the NFHS Network selects 150 high schools out of thousands to be a member of its honor roll and this year a student program from Point Pleasant Junior/ Senior High Schools (PPJ/SHS) was among the chosen. The Point Pleasant Live (PPL) program was recently named as a select school by the NFHS Network. According to the NFHS Network’s website, a select school has students who demonstrate excellent broadcasting skills. The NFHS Network is a joint venture among the National Federation of State High School Associations (NFHS), its member state associations and PlayOn! Sports. The NFHS Network celebrates and showcases the unique accomplishments of students, whether they are a student-athlete participating in the 27 different sports covered by the network, or one of the student broadcasters from schools around the country that produce events through the School Broadcast Program. Andrew Layton, PPL instructor, shared 100 schools are recognized for being a select school and 50 schools are recognized as elite in each year’s honor roll. This is the first year the PPL has made the NFHS Network’s honor roll. However, PPL has been receiving other forms of recognition since it has started in 2016. Layton shared last spring PPL was named as a social media finalist for a marketing award, PPJ/SHS was one of three schools chosen. PPL began as an afterschool program where students were making pod-casts and then formed into its own class in November of 2016. Junior high and high school students can sign up for the class. Though the high school students are more involved with the broadcasting, junior high students can begin learning the basics such as putting together videos and editing them. The PPL students record several events within their school such as sporting events, assemblies, graduation, class night, and school wide public service announcements to name a few. The typical sporting events PPL covers are home football games, home boys basketball games, and most home wrestling meets. Layton shared the students can and will record any event as long as WiFi is available for streaming their broadcast. The students also sell commercials to local businesses within the city. They visit the businesses to film the business’ commercial and during PPL broadcasts the commercial will run at least two times during the show. During class time, the students have been working on developing a news program and working on their feature stories. Also, the students work on other assignments such as editing videos. Layton shared he is happy for his students receiving this recognition as they are hard workers. The students do the majority of the work themselves with Layton as their supervisor and many are working towards learning skills for their future careers in broadcast journalism. Some information used from https://www.nfhsnetwork.com in this article.